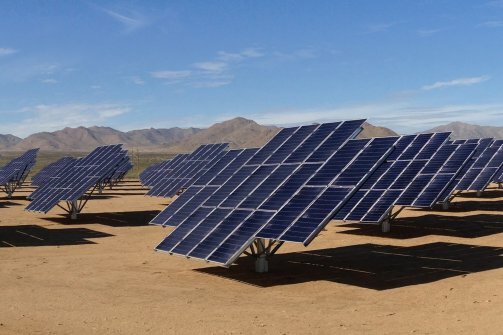 Seeking to reduce its carbon footprint and reduce the cost of generating power in the field, the U.S. military has become one of the most aggressive investors in renewable energy. This gives a new meaning to the term “military power.” The U.S. Department of Defense, the world’s largest consumer of fossil fuels, is becoming more earth-friendly. The Solar Energy Industries Association released a report Friday detailing the military’s recent commitment to power 25 percent of its electricity intake with renewable energy by 2025. So far more than 130 megawatts of solar voltaic systems have been installed in military bases spanning 31 states and D.C. The panels provide enough electricity to power 22,000 U.S. homes. The green-power move follows years of criticism over the DoD’s extreme intake of fossil fuels. In 2011 the department spent $19.3 billion on its annual energy bill, and it has a carbon footprint roughly three times the size of retailer giant Walmart. That same year the DoD consumed over 5 billion gallons of oil. The extreme energy use stems from two sectors: powering facilities across the globe and fueling military vehicles. Although the military gets a great deal on gas at just over $1 a gallon, the costs to transport the fuel to bases in far-off countries such as Afghanistan can add up to more than $400 per gallon, according to the SEIA report. Although the military gets a great deal on gas at just over $1 a gallon, costs to transport the fuel to bases in far-off countries such as Afghanistan can add up to more than $400 per gallon, according to the SEIA report. By supplementing even 25 percent of its energy intake with renewable energy, the military is hoping to decrease is carbon footprint and energy bill. The Navy currently leads the armed branches in driving the most renewable energy. It installed solar panels in bases across 12 states, which accumulate a total of 58 megawatts of electricity—more than the Army and Air Force combined. In addition, the Navy adopted a higher goal for renewable-energy use, hoping to obtain 50 percent of its energy from renewable sources such as solar and wind by 2025. One of the biggest military renewable-energy efforts was announced earlier this month. The Defense Department, solar firm SolarCity, and real estate developer Forest City are installing solar panels on 6,500 military homes in Hawaii.